It’s tough enough being single in Bangalore and with Tinder being unkind to Indians in general, getting a date is like getting a reservation on IRCTC during the season. That being said, when you finally do get that elusive first date, joy knows no bounds. But hold your horses, because now you need to pick that spot for your first date. You can’t pick something too fancy (unless you are that kind of a guy) nor a place that gives off Vasudeva Adiga vibes. Somewhere in between is what you want. Sparks and fireworks not guaranteed, these cafes, all-day breakfast places, and bakeries are perfect spots for the date and your wallet. Breakfast dates are a thing. And if you are asking her (or him) out for one, then this is where you need to head. Rooftop, quirky interiors, good music, and a yum menu that’s pocket-friendly are what you get here. Waffles and pancakes are between INR 100 and INR 200, while a breakfast platter would cost around INR 200. Fresh juice of the day comes highly recommended and it’s for just INR 60. See, you are more or less sorted with the food part of the date. The rest, my good sir, is up to you. For Brownie Points: Order the utterly sweet Funky Monkey Waffles in case you want to indulge your date. Oh, and there’s a pool table too in case you want to make things interesting. Who knows, she could be the Carmen to your Vincent — A The Colour of Money reference in case you didn’t get it. If your date’s living on the other side of Koramangala, take her out to this cute cafe in HSR. Known for their thin-crust pizzas, sandwiches and breakfast menu, a meal for two will cost you somewhere between INR 400 and INR 600. Maroon 5 and Coldplay will set the tone for the evening, while the al fresco table for two is the perfect spot to enjoy the evening breeze, the Virgin Mojitos, and the cheesy pizzas. Admire the fairy lights or your attractive date, in any case, this cafe can make dates casual yet comfortable. For Brownie Points: If things go well, take a selfie near the entrance — a pretty spot with lights, bookshelves, and a fish bowl. If books, home decor, and Pinterest are what your date is into, a date at this cafe inside a furniture store comes highly recommended. It’s got a vegetarian menu that’s straight out of Enid Blyton’s world of fairies, pixies, goblins, and naughty boys and girls. Where to sit? The really adorable corner that is done up with bookshelves with an eclectic collection of tomes, colourful buntings, a vibrant rug and two matching rainbow-hued upholstered chairs. What to order? The gigantic desserts and tea. For Brownie Points: Pick something for her from the store. It could be anything as small as a planner to something like a colourful mug or some fancy wooden clips for hanging photos. 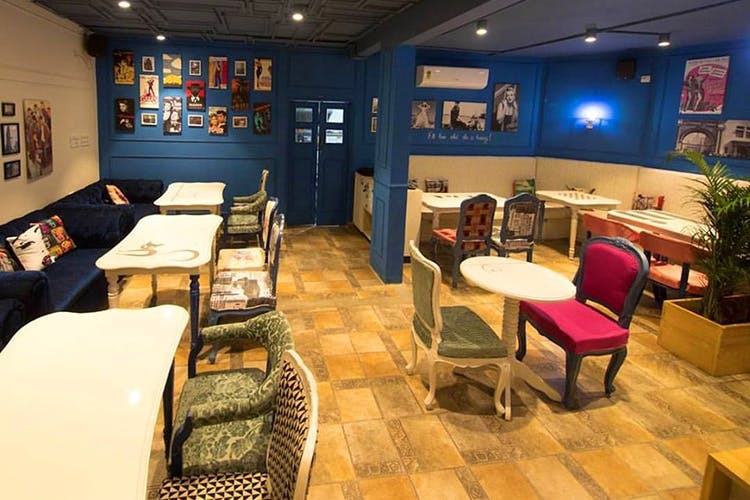 This quirky cafe in Kalyan Nagar is straight out of Alice In Wonderland. And should make for a nice conversation starter too. We’re talking bright blue walls with pop culture posters on them, mismatched furniture with different kinds of tables and chairs in every spot, with each chair upholstered in a different funky pattern and colour, and a proper cafe counter complete with a display case full of quick bites. The menu include pastas, thin crust pizzaz, burgers, and sandwiches Wash it all down with their mocktails or smoothies, or stick to your teas and coffees if it's that kind of date. Everything is reasonably priced and a meal for two will leave you about INR 600 short. For Brownie Points: We hear the plush blue couches are the best seat in the house. What you do with the information is entirely up to you! This quaint little cafe is known for its all-day breakfasts, sandwiches, and hot chocolate. The ambience is relaxing and casual with an al fresco seating. Throw in fairy lighting, greens, and comfortable seating and wooden tables, you have yourself a perfect setting for an evening date. For Brownie Points: Order the Belgian Waffles drizzled with honey and chocolate syrup. She can’t say no to that. Or your ordering skills. If her bio reads ‘dog lover’, forget all of the above spots and take her to this doggie paradise located far, far away (beyond Whitefield). You don’t need to do much on this date, just make sure that you get a lot of candid pictures of your date having a ball of a time with the pooches. Food is secondary here, just order a sandwich, fries, and Coke, and your bill would stand at INR 500. But, trust us when we say this, you’ll hardly be eating. With wagging tails and wet noses in abundance, there’s no way you can mess this first date up. For Brownie Points: Take candid pictures. Please. If your date's a Marvel or DC fan, then there's nothing like Cafe Down The Alley's comic-themed space. Your date will be amazed by the brightly lit spacious cafe, and the superhero murals and posters that line the walls and pillars. The cafe offers nice, comfy seating plus, bean bags for you to lounge around and relax. Plus, board games to pass time while you are waiting for food or to avoid any awkward silences. The menu isn't ''super' though, but hey, the sandwiches and pastas as well as the coffee that comes with comic-themed latte art keep things fun! For Brownie Points: Selfie by the Justice League mural! If you see #Wanderlust or #Traveller on your date's bio, then think no more and take her to The Vacationers Cafe. It's touted to be Bangalore's only travel cafe. The Inta-worthy rooftop setting overlooks Koramangala’s Hosur-Adugodi road is done up with pretty planters, a world map, and repurposed tree trunks for stools and tables that look like suitcases. And on the side, two tents for you to park yourself with your date. Yup, the tents aren’t props, people! Depending on how your date goes, you could have planned your next date with a night ride to Nandi Hills or back to your (or your date's) place. For Brownie Points: We told you the tents are perfect for dates, right? For Tinder dates that happen outside Bangalore, namely Whitefield, this is one spot that guarantees a good time. With big umbrellas over the tables providing comfortable shade, be sure to order some salads and pastas. But if you keeping it pretty 'sweet' there's waffles, pancakes and brownies. Pair it with a nice hot cup of tea or coffee or even hot chocolate and you've got the food taken care of. All that remains if for you and your date to enjoy the outdoor seating and the best of Bangalore weather. For Brownie Points: The cafe comes with a store attached and while you wait for your food, you can do a bit of window shopping with your date and find out what they like. That sort of information can come in handy later! It's the tropical greenery, the earthy interiors with soft lighting, and each corner created with a dash of style and space that does the trick. And when the menu is organic and the space is minimalist in ambience, you've got yourself a nice little South Bangalore date spot.Most dishes in the menu are dependent on the availability of seasonal and local ingredients. But you can expect delicious munchies such as the Aloo Patha Bhindi Chaat and Bisibelebath Fritters. For Brownie Points: Sit by the al-fresco balcony seating area.